He also answers a question about what he wishes he knew when he first started producing. While out promoting his new film Paddington, which was released in the UK back in November and will hit US theatres on January 16th, David Heyman briefly discusses the Fantastic Beasts and Where to Find Them films and reveals that production designer Stuart Craig will be back for the films. Stuart was the designer for all the Potter films as well as Universal’s theme parks. Thanks to Hypable for the tip! In a new interview with Digital Spy, producer David Heyman discusses Fantastic Beasts and Where to Find Them as well as their decision to split Deathly Hallows into two films. Watch below,and thanks to SnitchSeeker we also have a transcript. David is very soft-spoken so you’ll have to turn up your volume. I know you’ve said before it’s helped you in your career to have lived in America and here. So how does it feel to be going back to the world of Potter that’s going to be set in New York for Fantastic Beasts? David Heyman: Anything that Jo creates is exciting to be a part of. She has such an incredible imagination. It’s a privilege to have worked with her on the eight Potter films and to be working with her again on this. She’s written a wonderful script. I’m very, very excited. 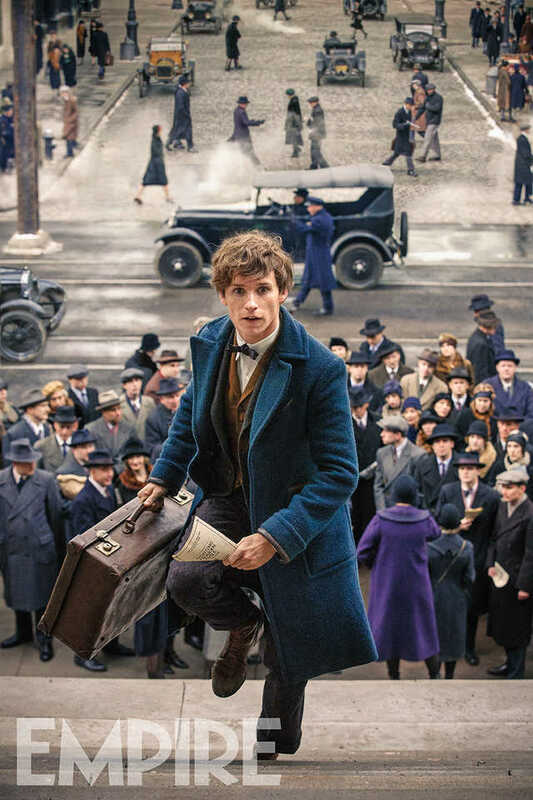 Are you looking to start casting soon for Newt? Heyman: I think we’ll probably start up sometime next year. How do you feel to have started this new trend – I think it was you – with Potter splitting the final chapter into two? It’s now kind of the norm. Heyman: That was so not a calculated decision. It was really borne purely out of creative imperative. I think if we’d done one film, it’d have been four-five hours long. As much as people’s attention is much … people love Potter – I think they would have struggled, and we’d have had to cut out too much to make it work. So, I know people will find that hard to believe but I promise you it was borne out of creative imperative. Actually it wasn’t me who had the idea. Someone else had the idea: Lionel Wigram, who is producing Fantastic Beasts with me. And my initial reaction was no. He said, “No, David. How are we going to do it?” And I reread the books, and Steve Kloves, the screenwriter, we discussed it. It became clear it was the only way to tell the story that we wanted to tell in the way that we wanted to tell it. I don’t know whether all the others are borne out of a similar creative imperative. Maybe. But that was the source of ours. In a new interview, Harry Potter producer David Heyman discusses the Fantastic Beasts and Where to Find Them script, which was written by J.K. Rowling and will be produced by Heyman. He also discusses his latest film, Paddington, which hits theatres on November 28, 2014.